To compute the trajectories of FFUs is not a very important thing, but is still meaningful. In this topic, we want to solve three problems. 1. We are wondering with which velocities and in which directions FFUs should be ejected to make sure that the separation between FFUs in 180 s after ejection is smaller than 2 km. 2. 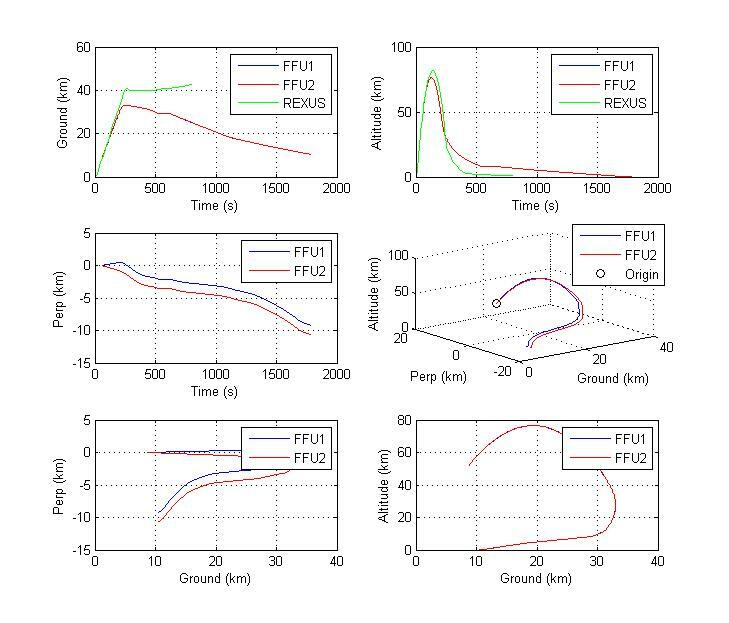 Effects of differential air drag on the rocket and on the FFUs need to be analysed so that the rocket does not block the line of sight between FFUs. 3. What we are also interested in is where the FFUs will land to guarantee that they will not land outside the allowed zone. And this topic is not a very simple thing either, we need to consider wind speed, ejection angles, atmospheric drag, and the most troublesome factor is the parachute deployment. As we know, when the parachute is deployed, the reference area of FFUs would change, and we use ode45( a matlab function) to solve a set of differential equations, so how to change the parameter of the reference area during ode45 execution? At first, I used if structure in the function differential equations. Unfortunately, this is totally wrong. After a lot of running and debugging this program, I knew that if structure lead to the wrong result. Well, finally, we obtained the reasonable result. So it is worth trying and doing everything. The result is meaningful, while the process teaches me a lot.